I live in northern hemisphere around 44th latitude. 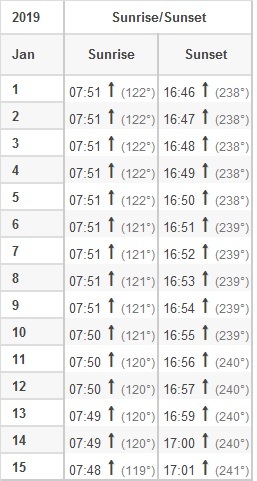 Starting from Winter Solstice, December 21, 2018 the duration of daylight is naturally increasing. What I observe, however, is that the duration increase is happening more in the evening rather than in the morning. In other words as days pass, the sunset seems to move forward much faster to a later hour than the first morning light moving backward to an earlier hour. Is what I am observing a true phenomenon or is it merely a wrong observation? If so why is this happening in an uneven fashion? I found the sunrise/sunset times for my area. It in fact confirms the situation. In the first half of January sunrise moved back only 3 minutes while sunset moved forward 15 minutes with respect to civil time. The eccentricity of the Earth's orbit around the Sun causes a cycle with 7.5-minute amplitude and 12-month period, with zeroes at perihelion (Earth moving fastest and closest to the Sun) and aphelion (Earth moving slowest and farthest from the Sun). The oblique angle between the Earth's equator (rotation plane) and ecliptic (orbital plane) causes a cycle with 10-minute amplitude and 6-month period, with zeroes at equinoxes (Sun crossing Earth's equator) and solstices (Sun farthest north or south of the equator). This answer explains how that works. These combine so that apparent solar time is 17 minutes ahead of mean solar time in early November and 14 minutes behind in mid February. Between those times of year, the apparent Sun falls several seconds behind the mean Sun each day, affecting both sunset and sunrise times as you observed. For further explanation, see the US Naval Observatory or Wikipedia. Not the answer you're looking for? Browse other questions tagged sunrise or ask your own question. Predicting accurate time of local sunrise in mountainous area? What's the time in which the sun rises?